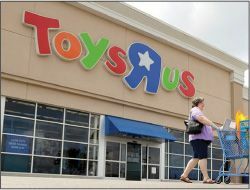 One of the world’s largest toy-store chains has filed for Chapter 11, said Lillian Rizzo and Suzanne Kapner in The Wall Street Journal. “Undone by a hefty debt load and the rapid shift to online shopping,” Toys R Us declared bankruptcy this week, becoming the latest casualty of the pressures facing brick-and-mortar retailers. The toy emporium, which operates 1,600 stores around the world and has 64,000 employees, plans to keep most of its locations operating as usual. Its main priority is restructuring more than $5 billion in long-term debt, which it has been laden with since privateequity firms purchased the company in a leveraged buyout for $6 billion in 2005.